The Fellowship was fortunate enough to obtain a copy of WILL EISNER’S THE SPIRIT #1 from Dynamite Entertainment. Matt Wagner writes, Dan Schkade draws and Brennan Wagner colors. It’s been two years since anyone has seen The Spirit alive. His friends are still trying to move on with their lives – Dolan is about to retire, Ellen has a new boyfriend, and Sammy and Ebony are getting by as private detectives. But there’s still crime in Central City, so Sammy and Ebony are finally going to do it – they’re going to find out what happened to The Spirit! The first half of this issue is a surprisingly emotional look at what the Spirit left behind when he disappeared, and it’s very well written. And if I’m being honest, I would have recommended this book just for the phone call gag – priceless grammatical humor is hard to come by. I really like the art style, too; it’s just the right blend of pulp comics and modern detail. This book could have been a straight dose of pulp comics, but instead it’s got layers of character, humor and style. I like where it’s going, so check it out. 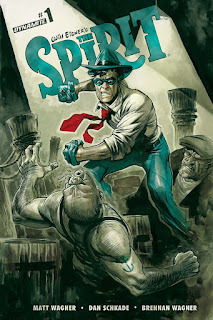 WILL EISNER’S THE SPIRIT #1 is available now at your FLCS or at dynamite.com.